Aurora Airlines and Danish leasing company Nordic Aviation Capital have signed an agreement for the purchase of two more Bombardier Q400 regional turboprops. The aircraft with serial numbers 4481 and 4482, both produced in 2014, were sold for 42.3 million dollars. The delivery may take place as early as the first half of this year. According to earlier information, the carrier was expected to take delivery of three Q400s this year (s.n. 4351, 4354, 4106). Two of these have already been delivered. In 2016, the regional airline’s Q400 fleet will be expanded by five aircraft. Beyond this, no further expansion is planned at the moment, according to what the administration of Sakhalin Region told Russian Aviation Insider. The regional administration provided financial support for the deal by increasing Aurora’s registered capital by 3.06 billion rubles. Last year, the authorities financed the purchase of a DHC-8-300 (Q300) for the carrier. The aircraft has already entered service and is used for passenger transportation and medical evacuation. 51% of Aurora is owned by Aeroflot, whereas 49% is owned by the administration of Sakhalin Region. 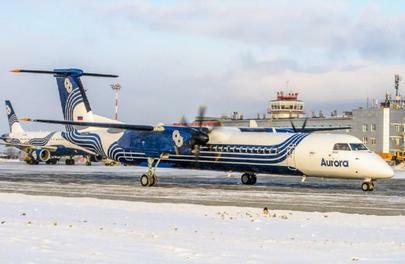 According to Aeroflot’s plans, three DHC-8s will be phased out and leave the Group’s fleet this year, and each year until 2020, one aircraft of the type will be phased out. Apparently, these are Q300s. Besides the two Q400s, Aurora operates ten А319s, two Boeing 737, seven Bombardier Q200/300s and two DHC-6 Twin Otters. In January its traffic grew 16.5% YOY to 85,100 passengers.